Neon Dreams is a 4-Piece Electronic/Pop group that is looking to bring something different to the EDM world. Hailing from Halifax, NS, Canada, Neon Dreams takes the typical production/DJ format of an EDM gig and adds live instrumentals to bring an entirely different element to studio recordings and on-stage performances. While all 4 members of Neon Dreams work in-studio on the production and writing side of the music, during live performances they each take on their own specific and key roles. On stage, Frank Kadillac remains as the group’s lead vocalist, Corey LeRue takes on the role of DJ/synth/live sampling, Matthew Sampson becomes the group’s lead guitarist and Adrian Morris is on the drums/live sampling. While different from most EDM acts today, they fit right at home. Their music, which ranges vastly from Electronic Pop to hard-hitting club tracks, is unique to Canada’s Atlantic coast and often borrows different sounds from many genres within the EDM world, further establishing the group’s distinct style.The members came together through their love of music, but as individuals, their musical backgrounds varied greatly. Neon Dreams collectively writes and produces their own original material, creating a unique form of Pop music taking influences from Hip-Hop, Electro, and Rock. T he band feels part of the ever-growing continuation of EDM music that consistently takes influence from the pop scene. 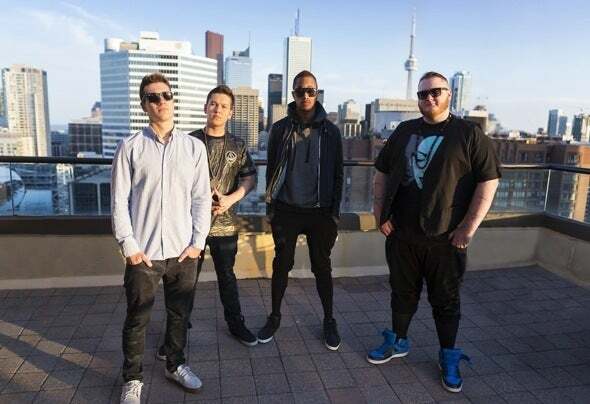 The group incorporates a House and Electro feel, with elements of a live band.Since the group’s breakthrough in the summer of 2013, they’ve received incredible success within the beginnings of their career.Among being selected as a showcasing artist for Canadian Music Week 2014 and receiving airplay on Atlantic Canada’s Top 40 stations, the group has partnered with East Coast Lifestyle on their Atlantic Canadian university tour. With this partnership, they’ve been able to tap into ECL’s huge audience of youth, students and trend- seekers throughout the Atlantic provinces. This winter, Neon Dreams will be writing, recording and rehearsing to prepare for Canadian Music Week 2014, Jibfest at Marble Mountain, Newfoundland in February of this year, as well as a Canadian Spring tour in support of their upcoming releases.